With this mission in mind, Brendon and Panic! At the Disco (P!ATD) created the Highest Hopes Foundation which supports the efforts of non-profit organizations that lead, develop, and advocate support for human rights. The foundation is dedicated to those who are subject to discrimination or abuse on the basis of gender, race, religion, sexual orientation + gender identity. 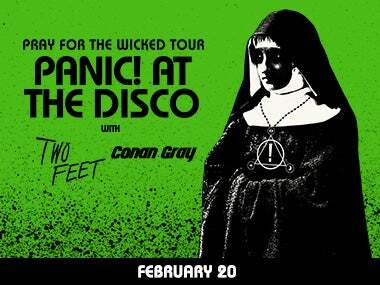 To start things off, P!ATD is donating $1 from every ticket purchased for their Pray For The Wicked Tour to the Highest Hopes Foundation. But that’s not all. At each stop during their tour, there's an even more unique and exciting way to donate. "The Amazing Beebo" fortune teller (aka “Lil Brendon”, the puppet from the “Hey Look Ma, I Made It” video) will be traveling with the band and coming to your city. Bring your luck, because only 500 fortunes will be distributed each night. All the proceeds go directly to the Highest Hopes Foundation. We can’t wait to test our own luck here in Sacramento and get our fortunes from Beebo! In the mean time, help spread the love by texting HOPES to 50555 or visit www.highesthopes.org, and don't forget to grab your tickets for the Pray for the Wicked Tour in Sacramento, Feb. 20, 2019!